Is the concept of a “lead mare” a myth? German research suggests that any member of a group of horses is able to initiate movement, rather than just a “lead mare”. The idea that groups of horses have a “lead mare” responsible for guiding and disciplining members of the group has become widespread in recent years, but fresh research by a German professor suggests it may be no more than popular myth. Professor Konstanze Krüger watched her own horses closely, but was not convinced the highest-ranking mare dictated the movement or action of the rest, so she took a team of researchers to Italy to study the feral Esperia horses. Kruger, from Department Equine Management at the University of Nürtingen, and her assistants recorded the movements of three groups of horses, numbering 55 in total. The groups were observed during two research periods one year apart, and the social hierarchies as well as the movement patterns were examined. The team considered two types of movement initiation – herding (that is, driving other members of the group from behind) and departures (setting off in a particular direction, and other group members following). While popular belief says that a mare holds the highest rank in the group, this was not the case. In one group it was a stallion, and in the other two groups stallions were in ranks second and fifth. Only the alpha stallion, the highest ranking stallion in the group, showed herding behaviour and on each occasion it resulted in movement of the whole group. Perhaps most surprisingly, mares of all ranks initiated movement by departure, and it was definitely not the case that the highest ranking mare moved, and everyone followed. Although high-ranking mares were a little more likely to be followed than low ranking mares, there were plenty of occasions where low ranking mares were followed by several other group members. Kruiger says the findings call into question the whole concept of a “lead mare”. The results suggest that movement, at least, has distributed leadership, with any member of the group able to initiate movement by others. There does not seem to be a lead mare in the sense of one horse who makes the decisions for the group. This has interesting implications as far as the human relationship with horses is concerned. While the hierarchy may be largely stable, the minute to minute decisions may be governed by other factors, and being a “boss” does not necessarily mean that you become a leader your horse would choose to follow. Krueger, K., Flauger, B., Farmer, K., & Hemelrijk, C. (2014). 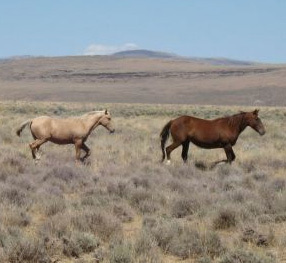 Movement initiation in groups of feral horses. Behavioural Process., 103, 91–101. The need for dominance, and the idea that there is only one way true way to work with ponies, and horses, is gradually being eroded. Working with ponies is like working with people. If someone had a simple answer that worked, they would be ruling the world, not mucking around with ponies. Ponies are people, treat them that way, it works as well as any other system. I’m sorry but I just read an couple of articles that said “the lead stallion is the myth” Oh just forget I don’t know who to believe.